BlackBerry has launched the Q5 smartphone, aimed at the low-end market. It was unveiled by the manufacturer’s president and CEO Thorsten Heins at its BlackBerry Live event in Orlando this morning. It will go on sale in selected markets in Europe, the Middle East, Africa, Asia (including the Asia Pacific region) and Latin America from July. BlackBerry confirmed it will go on sale in the UK. The Q5 will be the third smartphone to run the BlackBerry 10 operating system, following the Z10 and Q10, which have so far been released this year. 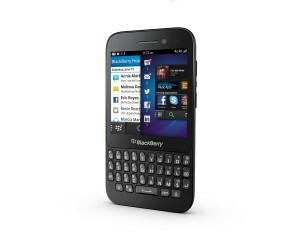 Similar in appearance to the Q10, it has a 3.1-inch touchscreen and full QWERTY keyboard. It will also feature BlackBerry Time Shift, which lets users take a range of photos and choose the best one, and BlackBerry Story Maker to enable users to create a story and join together multimedia into a film. It also includes BlackBerry Messenger, which since the launch of the new platform, lets users have video conversations and share screens.